Admittedly, by fans across the world, armchair coaching is so difficult and tiring that by the end of the game, we are all out of energy and so wiped out that the last thing we want to do is load the dishwasher or clean up the floors. Just like all of you amazing armchair coaches with tons of other fans in the house, I want to slink back and just enjoy the game rather than be the ‘beer here’ server running through the stands! Self-serve parties are amazingly sophisticated, and you can make them effortless. Today we are getting ready to decorate for our next Football party because each and every time our team plays we have a wonderful football party. I will tell you that it does not take a lot of effort to achieve a quickly decorated home. In fact our house is all about the party as we celebrate the Pittsburgh Steelers weekly with great pride and gatherings! Getting everyone together should not be time-consuming work, but something that you do that yields a quick, fun result. 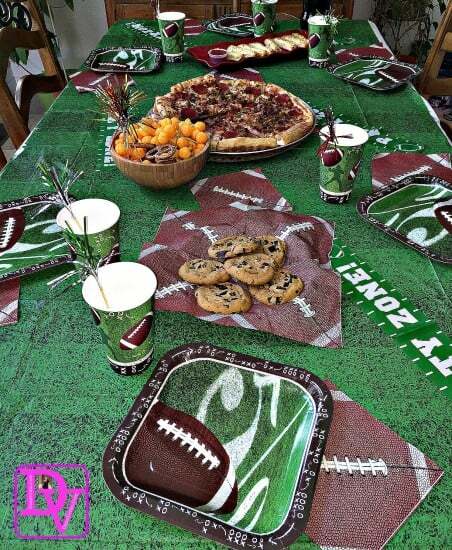 Enjoy learning how to decorate for football parties and lavishly live the celebration out loud! The goal of decorating for party is to turn a room’s ambiance into Party Mode, like turning on a light switch. I find that effortless parties are the best kind of parties! Finding items that quickly change a room from basic to party-tastic is easy and if you find a few products that can be reused over and over again you will just have them as your go-to. I have found a few football party staples I keep on hand to make a football game a party and I have a few that you can buy in bulk when you are out! Remember the biggest party planning basic: More is not better it is just more, while a few well-placed items can really energize a room without wiping you out from set up. Partying in any room means that food and feet will be there! While you may not think about it ahead of time, the worst can happen. I served Chocolate Covered Strawberries in our newly finished dining room, with tons of finger sandwiches, and after a few people had a few drinks, the strawberries somehow landed on very light beige carpet. Needless to say, the stains refused to come out and I also don’t serve those without a good carpet tossed below our dining table for an accent! 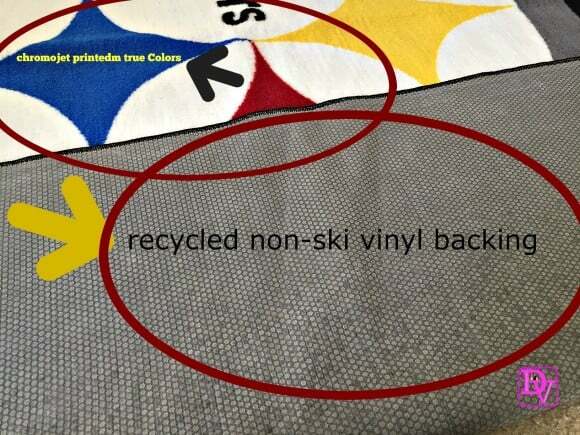 When we get ready to gather our friends, my first throw out is a gigantic, fun Steelers Ulti-Mat, also called a FanMat! Take a look at it, and it is easy to store and easy to clean. You can see that I am not getting a whole lot of help to pull the party together, rather they begin using the FanMat as a place to play Mini Football games. The size of this mat is 60″ x 96″, making it a perfect FanMat to put under any coffee table, in case things spill off the table, or under any kitchen table, or in any room that just needs a POP of color. Of course a very effective and easy way to cheer your TEAM on without doing much! I love this mat as it celebrates the NFL, and the construction on it is TOUGH because it is made with nylon carpet fibers and offers a recycled non-ski vinyl backing. When we put this down on the kitchen floor, it STICKS, and you are not going to go sliding when you get on it! The print on this is rich and deep in fact, the NFL Logo for your team was chromojet printed into the 100% nylon carpet which means you are getting TRUE colors, not colors that are close. Here is the best news, Everything Doormats offers so many other teams that you are sure to find one you love, just don’t bring yours to my house if we are partying together, as the house hostess gets to celebrate her team colors, lol! If you have to choose what to spend most of your time on, my suggestion is all about the food table. Guess where everyone will spend the most amount of time during a football game? If you answered around the food, you got it right. Whether the food is centrally located, or set up in a separate room for 1/2 time, put your work into presentation as kit keeps the spirits high and the party on! On a recent shopping trip I purchased 8 of these plastic Football table cloths. These are plastic, and can either be placed on top of a larger table cloth as a layering effect, cut down to the size you need, draped over a Chef’s center island or just on the table itself. The practicality of the plastic party tablecloth is the cost and the ability to just toss it in the trash when we are done. Of course if it is not messed up beyond all recognition, by all means, wipe and reuse. Another key element to the table that can change appearance quickly are football-themed paper napkins. I use them to line the chip baskets, the cookie trays and as actual napkins. I also just buy plain ones as well that are black and gold it is all based on what I can find when I am at the store. I buy these by the 8 packs as well and just pull them out as we plan the party, therefore I am not out running around buying up all the things we need over and over again, it’s called ONCE AND DONE. Why throw a wrench in if something works, just buy more and be done with it. 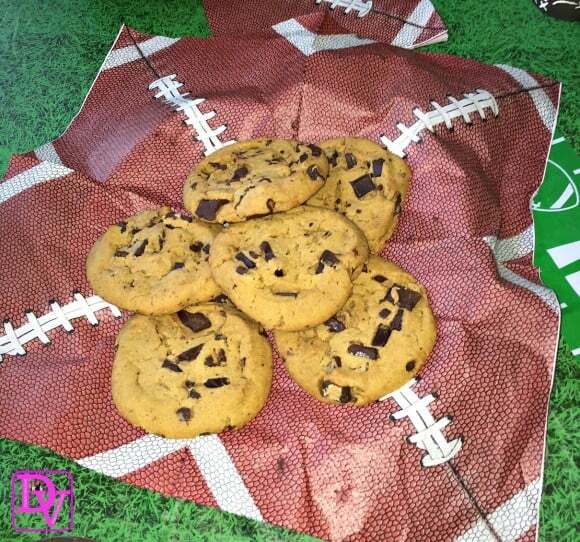 Party paper plates for football are great, and you have so many options. 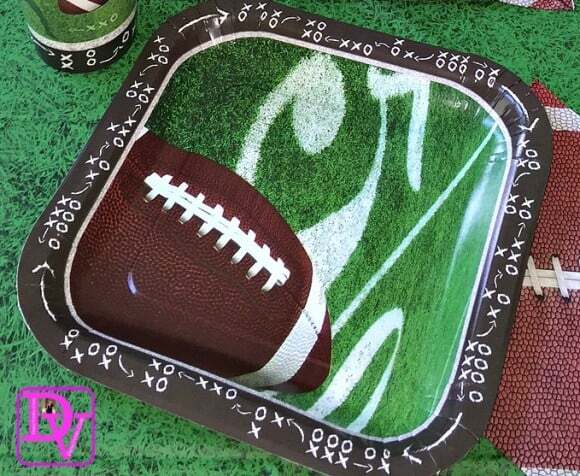 For our most recent party, I used these football plates, they matched well, and I love paper because if you want to warm something up in the microwave it can take it. The beauty of the Football paper plates is once they are used they are tossed! No dish-washing and guests clean up after themselves, I am not the maid. I pretty much figure if I host the party, then you can take care of the rest. Who needs cheerleaders when you can have sparklers that look like pompoms but are there to spear food, which becomes a true winning combination. 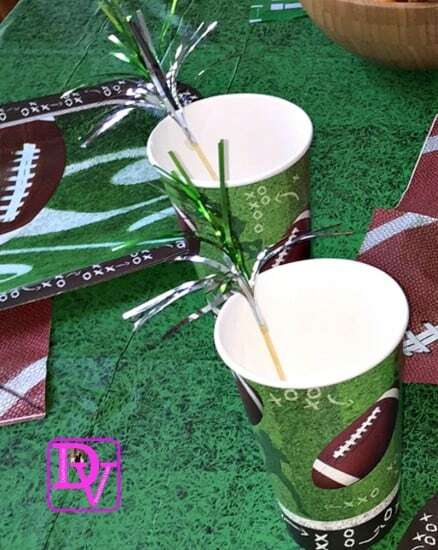 The addition of some fun paper cups that are football themed for a party work well and we also use big plastic colored cups that are black and gold as well. The Paper cups are good because we usually have a pot of coffee on so the cups can be used for either hot or cold beverages, while the plastic cups are just good for soda and beer, not warm beverages. The good thing about both paper and plastic is that you can theme the colors around YOUR team and in the end, they all get tossed out, no dishes, a huge WIN for me and you. I have placed a pick inside that looks like a PomPom. Many of the foods we are serving from Chunks of cheese to strawberries, cuts of melon, etc., will offer the opportunity to use the well-placed pick. As I am writing this I am going to make a note of caution ****the picks are not toys, and children should be supervised when using the picks as they do offer a sharp point!. The picks come in so many colors that you are sure to find your team’s color. Still looking for food inspiration? Still in need of recipes for the game day? Parmesan Crisps are easy to make, These Italian-Inspired crackers will make your mouth water and of course these traditional Chili Pierogies are a must for any party. Don’t forget to toss up a Greek Salad and a few Almond Croissants for good measure. If you want to celebrate a football game and keep the food effortless, you definitely want to read my article on 3 Tips for an Effortless Football Party which shows you all the eats, from pizza to bread sticks and where to find them in one stop not many! Take a look at some of our food! This armchair coach is going to go kick her feet up in the coach recliner and make sure that the refs are making all the right calls, as I am joining in on our party to get a little rowdy for the team! Are you ready to make some noise and kick back? I hope these tips of How To Decorate For A Football Party helped make it easier so you can lavishly live football and partying out loud in your seat, rather than on your feet! 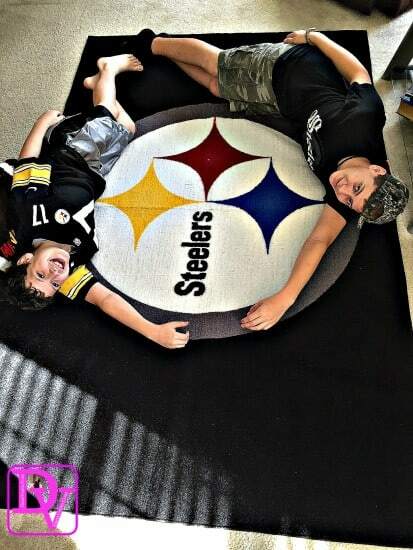 Did I say, “Go Steelers?” What do you do to decorate for a Football Party? Need More Delicious Foods For Football Parties? This is all so great! I’ve actually never been to a superbowl party but you make it look like so much fun! It’s definitely getting easier to find fun football party supplies. I like knowing there’s a tablecloth available now! Awesome tips. They will surely come in handy for future SUPERBOWLs too! Your table looks great. We like to watch Hockey games together. I always make a ton of finger foods to enjoy while we watch. You have presented some amazing ideas. I love the sparklers idea. Looks like an amazing game day party!! We are so excited for the Big Game tomorrow and our game day spread!! You always have amazing ideas I love the fanmat so creative! Love your ideas, especially the Football paper plates and a FanMat! These are so cool 🙂 Have a wonderful football party! Lots of great football decorations. My husband would love this for our party. Not really a sports fan, BUT, since I live in The Carolinas you know I will be sporting the colors and screaming at the TV! You made it look so easy and fun! I’m not a big football fan, not the “American” football anyway, but I can certainly take some decorating tips from here. I like how you used the open napkin as part of the decorations to put the cookies on. Love the football decorations! looks like you had a bunch of fun! Since I live in Pittsburgh, it is almost a prerequisite.. therefore:) ….. I celebrate the Pittsburgh Steelers, weekly! Now this is share-worthy! Love it! This made me smile! Football is Always shareworthy! I love your table….it looks so great! I also love the tip about the rug. That is the best idea! These are awesome tips, I’m not that into football but I find these football themed party accessories adorable. Definitely makes the game more enjoyable. Will definitely try some of these ideas especially the Fanmat! That is genius! Football parties are fun, you just have to make sure you are the loudest Armchair Coach! What a great idea for a football party. I love the fanmat and the overall setting. Great post. My hubby and the two boys was a huge fan of footballs. I love your ideas. Football season is indeed here. I love watching the games with my family. I live in a male dominant household and it can really get noisy and messy. The tablecloth shows all out support for my football crazed family. Not only did you create a perfect football party but you also went into detail why you made each decision. Props to a great post. OH I am a detail girl. :) Like why use paper cups vs. plastic. If you are going to buy a party supply it needs to make a lot of sense:) thanks for stopping by ! We have people over for the game all the time. Loving your ideas. You are so sweet! I just put out what We do I am glad they are helpful! Hope you kick back and have a beer! I love the idea of a FanMat! And, finger foods are definitely the hit at our mini-tailgating parties! Having easy to eat party foods is always a plus! Jessica Harlow recently posted..Don’t miss 40% off regular priced items during the Crazy 8 Columbus Day Sale!